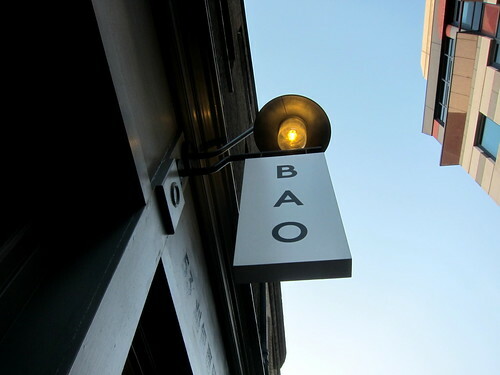 Do we need another review of BAO? Probably not but here’s mine anyway! Last week we tried our luck in the queue at 7pm and 90 minutes later, the three of us (me, Vivian, Felicia) finally got in. There’s always a queue here; be prepared for it or be prepared to find another place to leave. Every time we thought we’d vacate the queue, we’d move forward one spot and then we’d wait again. There are only 30 seats inside. Anyway, 90 minutes later, we were finally in (while in the queue, I did feel quite sorry for the couple seated right by the window as everyone was ogling their food). Anyway, we’d already made our selections on the order form in the queue so we handed that over and waited impatiently. With three of us, we were able to sample almost the entire menu. Sides and small eats (xiaochi) arrived first. 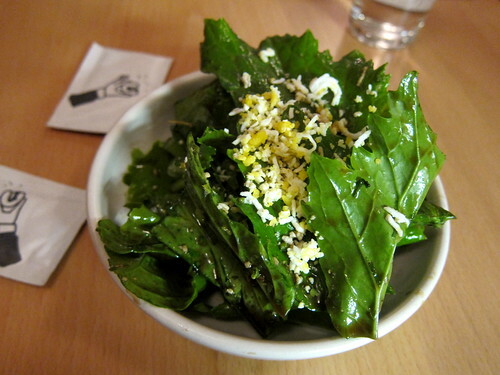 Turnip Tops, Salted Egg (£2.5) turned out to be raw turnip greens in a spicy black vinegar dressing with, yes, grated salted egg on top. 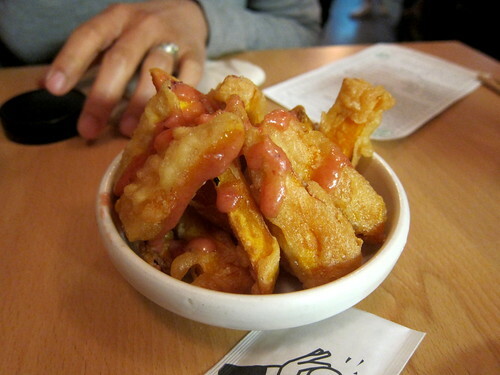 Sweet Potato Chips, Plum Pickle Ketchup (£3) were beautifully fried and perfectly crisp. The frying in this restaurant was top-notch. 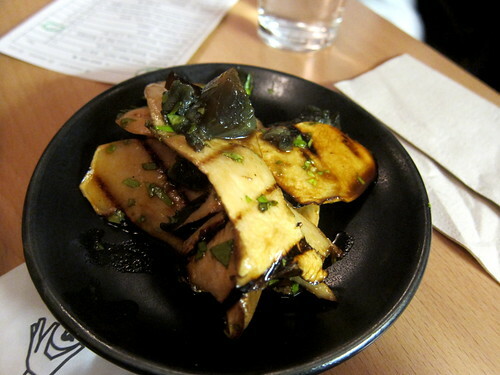 Eryngi Mushroom, Century Egg (£4) – I loved this dish. The mushrooms had been thickly sliced and grilled and topped with a couple of slices of the black jelly that is century egg. 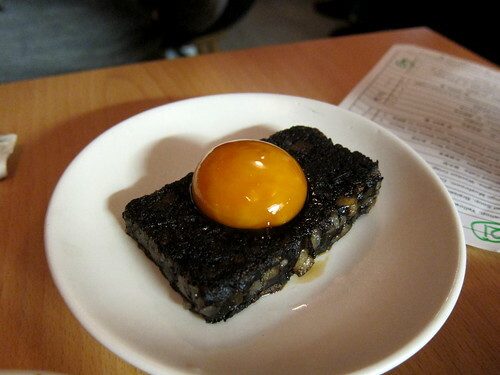 Pig Blood Cake (£3.5) was a slice of something like black pudding topped with an egg yolk. This was fantastic – all earthy darkness brightened by the sun. Sorry, that probably sounds ridiculous but it really was very very good. Taiwanese Fried Chicken, Hot Sauce (£5) was. just. fantastic. 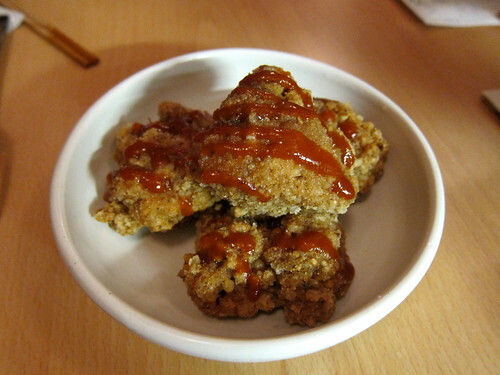 Ah, I’ve never met a fried chicken I didn’t like but this really is near the top of my list. 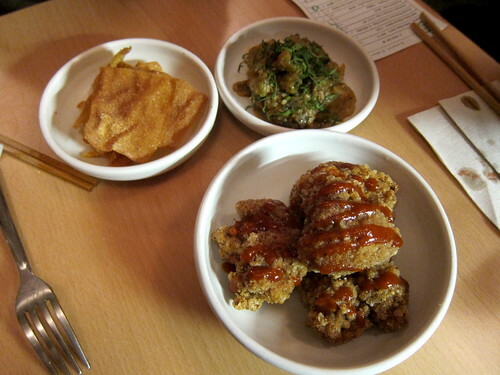 Now, I adore aubergine but the Aubergine, Wonton Crisp (£3.5) didn’t exactly light up my life. While I enjoyed the silky vegetable on top of the deep fried wonton skins, perhaps it was overshadowed by that fried chicken that arrived at the same time. 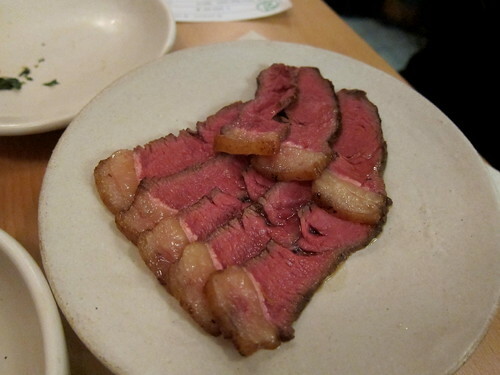 Aged Beef Rump Cap, Aged White Soy Sauce (£6) is probably one of their more famous small eats and for good reason. This was some seriously good beef – very tender and flavourful. I’m not entirely certain what white soy sauce is but whatever sauce there was was delicious. 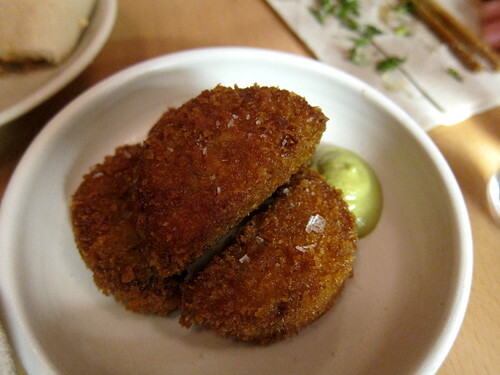 Trotter Nuggets (£4) were melting little morsels that reminded me very much of David Chang’s pig’s head torchon…only this was made up of the other end of the animal. That green sauce on the side packed a surprising heat! Guinea Fowl Chi Shiang Rice (£5.25) was one of my favourites that night. 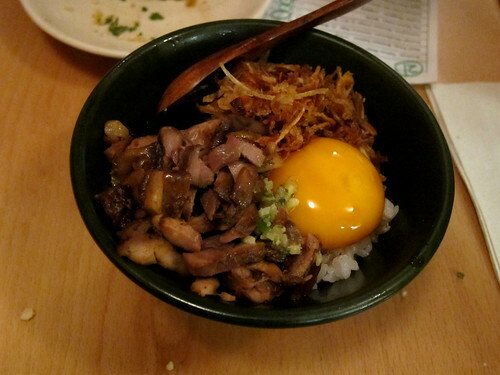 This bowl of rice was topped with lots of lovely things and an egg too. We were told to mix it all up together before tucking in and little bits of fried shallots and pickles peaked through the mixture. Fabulous. Of course, we had some of their baos too. Their Daikon Bao (£3.5) was rather inspired. 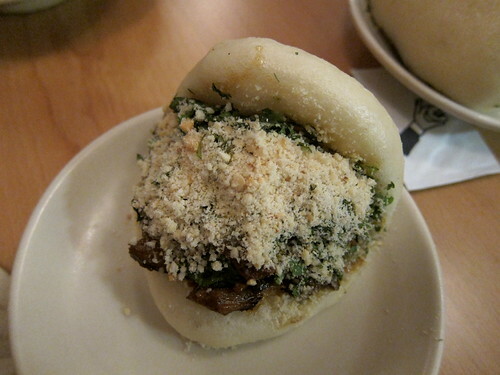 Inside the soft pillowy steamed bun was stuffed a deep fried patty formed of grated daikon. And there’s a thin slice of daikon on top of that to remind you of what’s inside. A Classic Bao (£3.75) was fine with lots of pork in there and peanuts on top too. 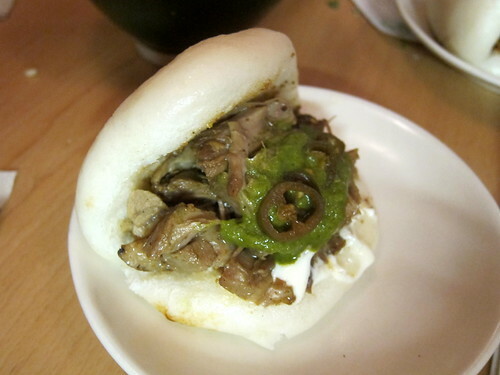 Lamb Shoulder Bao (£5) was braised lamb covered in more of that green sauce. 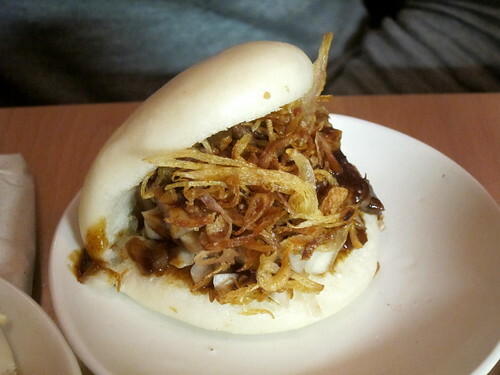 Confit Pork Bao (£4.50) – well, at this point, I wasn’t entirely sure what differentiated the confit pork from the regular pork as the mound of fried shallots somewhat overwhelmed it all….and I normally really like fried shallots. 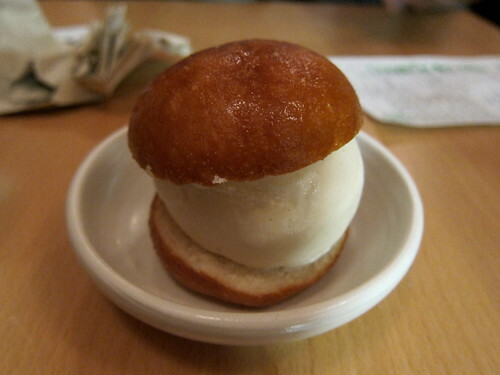 And for dessert, I was by myself with my Fried Horlicks Ice Cream Bao (£4). The ice cream was brilliant – I do like me some Horlicks – and the pairing with fried bread was fantastic. I would have liked a little less bread but I was pretty full by that point and perhaps this was my stomach crying out for help. Overall, I preferred the sides and small eats to the main baos; of all the baos we had, my favourite was the daikon one. 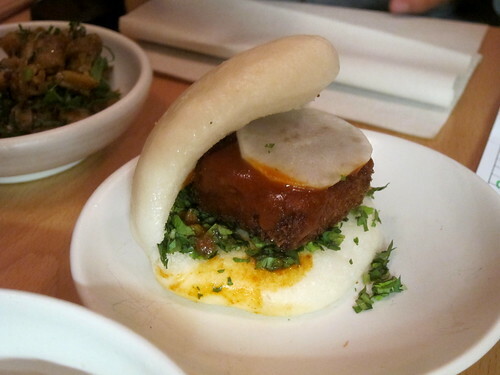 Perhaps next time I’ll try their fried chicken bao (I can’t see how I’d ever dislike that). I’ve heard the queue is much shorter earlier in the week; I’ll try anything to shorten the length of time I’m queuing!